The Kent Diamond and Pearl Fringe Tiara is a comb-style take on a fringe tiara that includes diamond uprights of alternating heights – the tallest ones topped with a single pearl each – set on a bandeau of round and lozenge-shaped diamonds. It goes by many names, and there are at least two theories about its provenance. One popular explanation is that it was a gift from the Duchess of Kent's parents and could have been a Worsley heirloom, but an alternate explanation is that it is a transformed piece from Queen Mary. Queen Mary owned this petite bandeau tiara, which she purchased in the 1920s and later had altered so that she could use some of her Cambridge cabochon emeralds on top (these same emeralds are also used as pendants for the Grand Duchess Vladimir Tiara). She left the bandeau – without the emeralds, obviously – to her daughter-in-law Princess Marina, Duchess of Kent. It was worn by Marina’s daughter, Princess Alexandra, and then ultimately passed on to Marina’s daughter-in-law, the current Duchess of Kent (Katharine). Katharine wore this on her wedding day and for other engagements in the early years of her marriage. 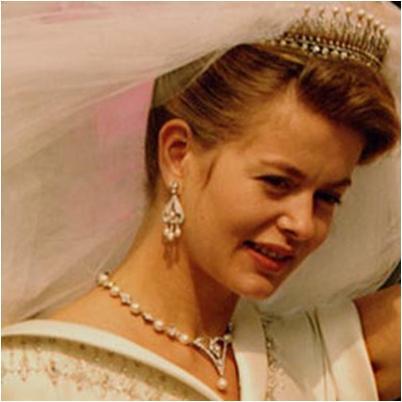 But the bandeau tiara disappeared after a time, and hasn’t been publicly seen in decades. By the late 1970s, the Duchess was wearing the Kent Diamond and Pearl Fringe Tiara, and so one theory has it that the bandeau tiara was reconfigured to create the fringe tiara. There are distinct similarities between the two, particularly the fact that the base bandeau is the same design. Personally, I believe that it is the transformed bandeau. 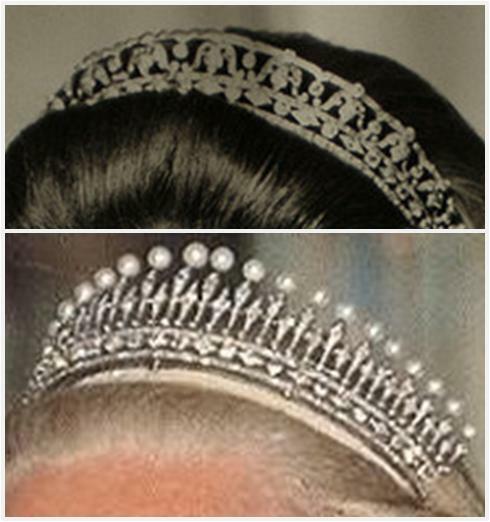 The switch off between the two tiaras makes sense in this context, especially when you consider that the Kents sold the largest tiara in their inheritance – the Cambridge Sapphire Tiara – leaving Katharine without a grand tiara at her disposal (they reconfigured the parure to maintain a sapphire tiara, but it is not so grand). Either way, the Kent Pearl and Diamond Fringe Tiara became very popular with the Duchess of Kent and was worn by her daughter Lady Helen for her 1992 wedding to Tim Taylor. It hasn’t been seen in quite some time now (not since the mid-1990s, I believe), since the Duchess has mostly retired from the royal life and no longer attends tiara events. Which theory of origin do you believe?